The long-standing flagship comedy brand, Kings & Queens of Comedy, has kicked off the year with a new look to match its royal entourage. The first show of 2019 will take place at the Durban ICC on February 16 and guarantees to be a show of hysterical proportions! 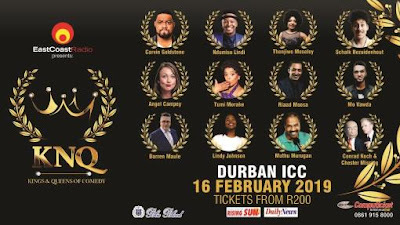 The royal court of South Africa comedy giants includes Angel Campey, Carvin Goldstone, Muthu Murugan, Ndumiso Lindi, Riaad Moosa, Schalk Bezuidenhout, Tumi Morake and the unmatchable team of Conrad Koch and Chester Missing, with some new faces joining the Kings & Queens of Comedy family - Thenjiwe Moseley, Mo Vawda and Lindy Johnson. 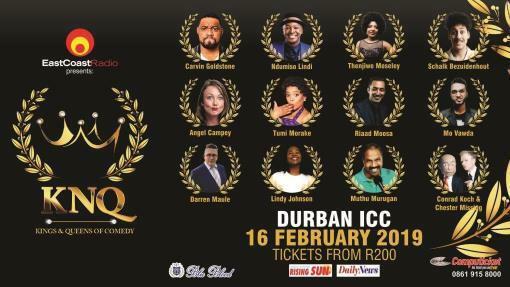 And no Kings & Queens of Comedy event in Durban would be the same without its royal host, Darren Maule. Having made a name for himself over the past two decades, Maule’s humour, intelligent banter and storytelling and raucous laughter has made him a household name across Durban, which is why he returns to centre stage as the host of this royal affair. Known as the ‘King of Indian Comedy’, Muthu Murugan has been wowing audiences for many years. Ndumiso Lindi, the gentleman of South African comedy, otherwise known as Roosta, effortlessly blends new-age style with old-school traditions. His deep voice, soul-warming smile, booming laughter, original content and seamless delivery makes for a comedy act that is outstanding and soulfully South African. These comedy heavyweights have shined their comical armour and sharpened their witty swords and are ready to kick off the 2019 comedy calendar as they take hilarity to the next level. The show is rated PG16. Tickets from R200 are available from Computicket outlets and online. Another hilarious production brought to you by Blu Blood and East Coast Radio.